What’s Guavacheese? It’s a dessert made from Guavas, Sugar and lime juice. In some countries it’s also referred to as Romeo Juliet. Guavacheese is used as a spread on toast and some served with pastries. It’s a simple recipe made with basic ingredients found in kitchen. I will come up with more authentic Goan recipes for Christmas. 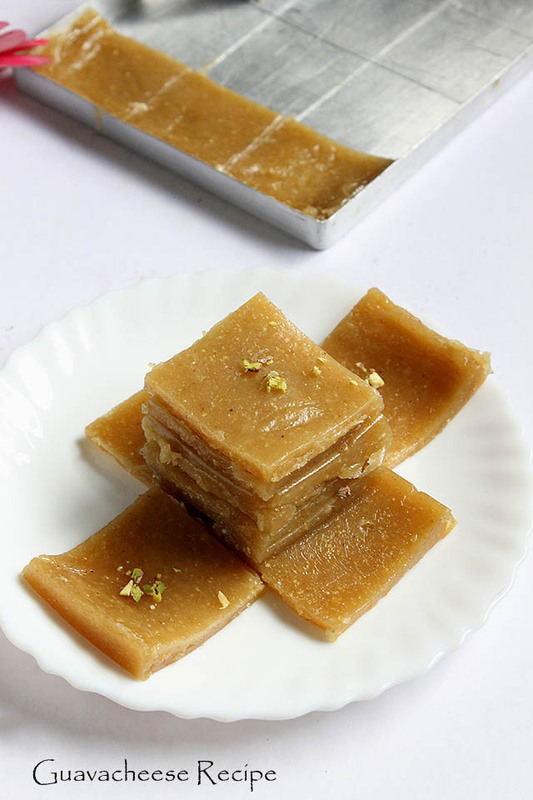 Love Goan food especially coastal food preparation and also the sweets which are less popular. I have already tried Goan Dodol, Rose Cookies, Goan Neuris, Doce De Grao and Eggless Baath Cake. 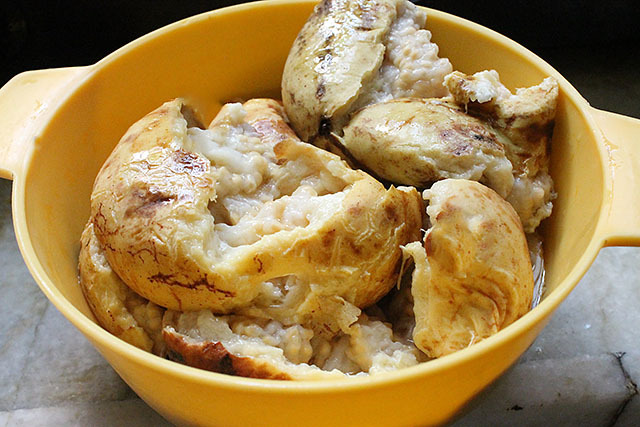 For this recipe you will have to select the soft Guavas not the one with hard skin. Further you will have to blanch them in hot water Or boil them until it gets tender. Later remove their seeds with the help of a spoon Or finger. The secret to this recipe is there should not be a single guava seed else it will come in your mouth while eating. 1. Pressure cook the guavas with water until one whistle. Alternatively you could boil them in hot water until tender. 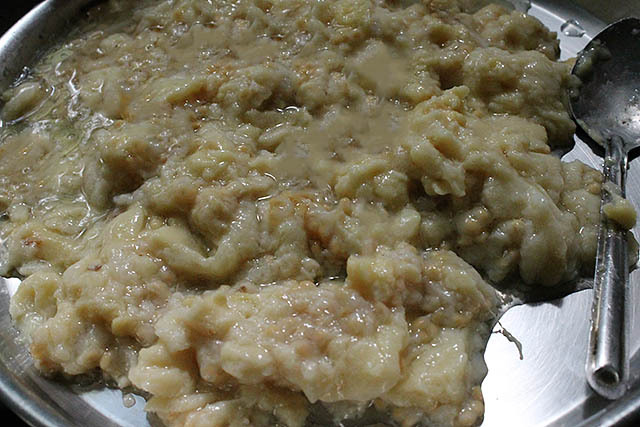 Grease a baking tray Or dish with oil and place aside. 2. Now comes the tough part peel off their skin and remove the seeds as much as you can. If seeds are yet into the mixture don’t panic it’s okay. 3.Once you have your guava pulp ready. Collect them and grind for 2 to 3 mins. 4. 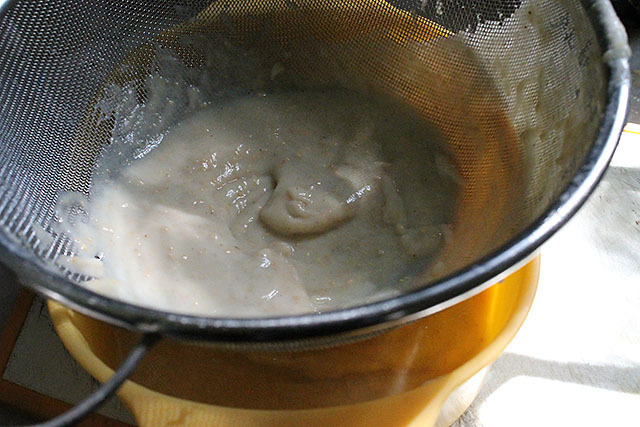 Take a fine mesh strainer and sieve the mixture gently. 5. 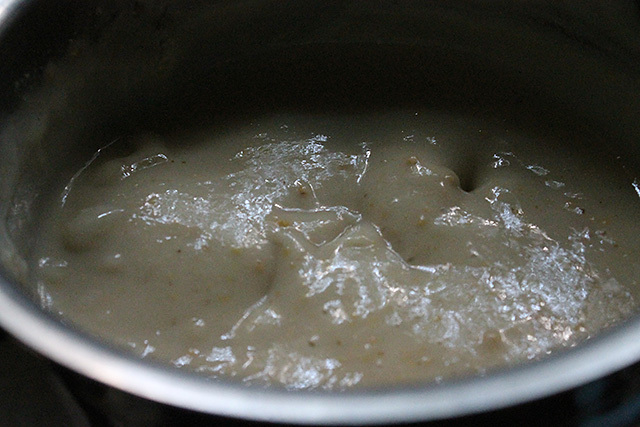 Once the pulp is gathered it should look appear like this. Discard this left over seed. 6. Important part is weigh or measure the guava pulp. 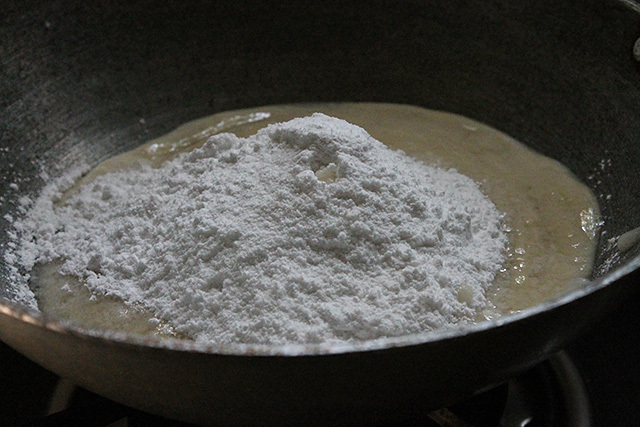 For instance if you have 2 cups of guava pulp then add 2 cups of powdered sugar. It should be in equal ratio. Take a wide bottomed vessel / kadai or pan add guava pulp. 7. Now add powdered sugar and place on low heat. 8. Mix all nicely and add lime juice. 9. Keep stirring and don’t allow the pulp to stick to the bottom. Cook on low heat. 10. The color will slowly change so is the texture. 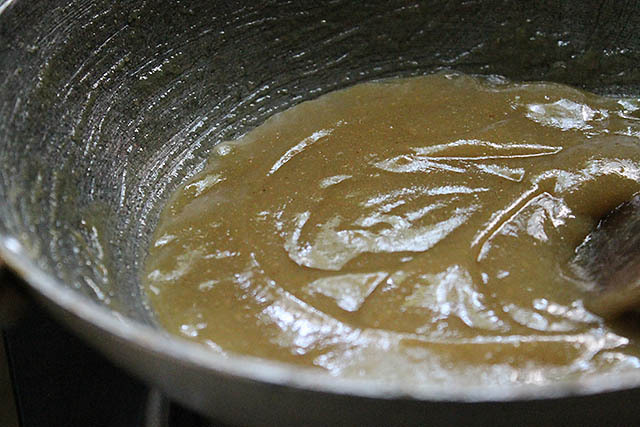 Once it starts thickening add dash of oil / butter/ ghee this would help in giving a nice shine and glaze to your guavacheese. 11. 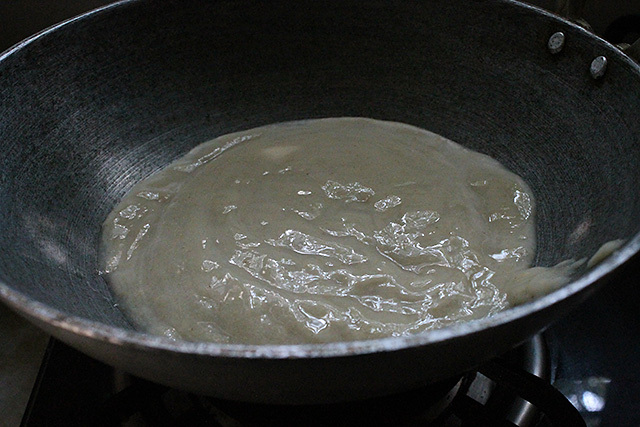 The mixture would start leaving the edges of the pan. You could check this by a simple test put one drop of this mixture in water. If it solidifies your mixture is ready. 12. 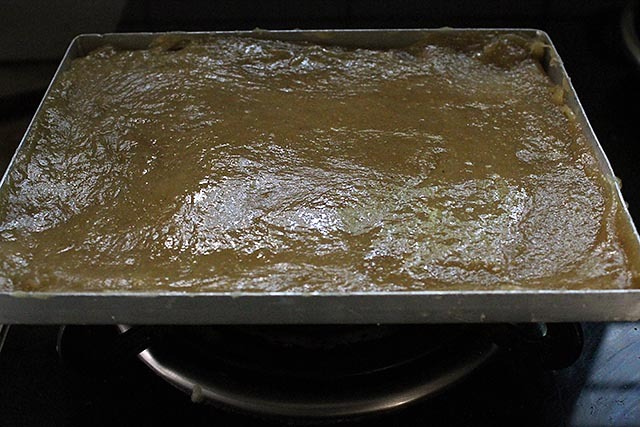 With the help of cloth or gloves pour this hot mixture over the greased tray. With the help of spatula make the surface smooth and even. I greased a small metal bowl and with the help of it leveled the surface of the guavacheese. It’s important to level them while they are hot once they cool down it would be difficult to do so. 13. Allow to cool down cut into squares or diamonds. Serve guavacheese Or store into an airtight container should live upto a week. I have just garnished with pistachio flakes however that’s optional. 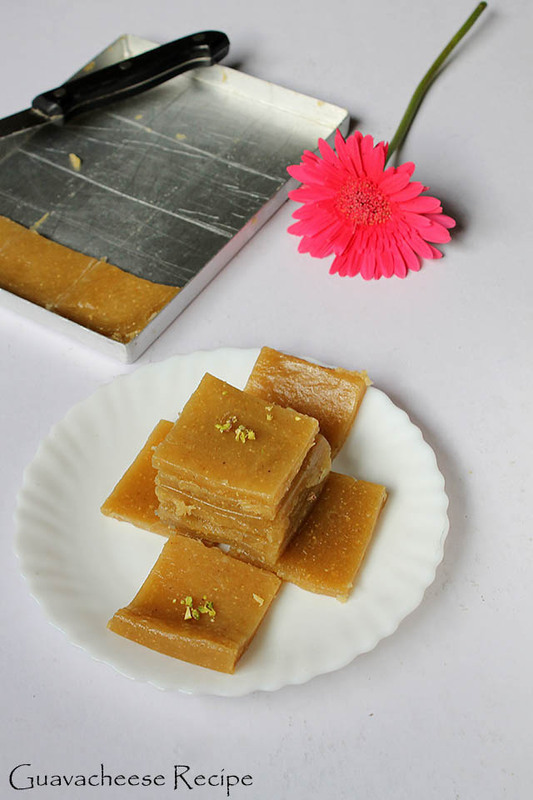 Guavacheese recipe - a classic Goan festive sweet! Guavacheese is also known as Perad and Goia-bada in Portuguese. 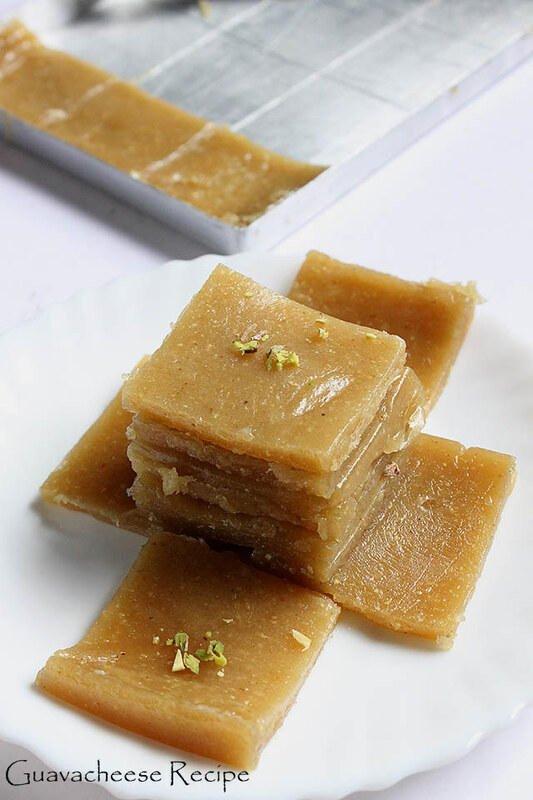 One of the most famous sweet from Goa. Pressure cook the guavas with water until one whistle. Alternatively you could boil them in hot water until tender. 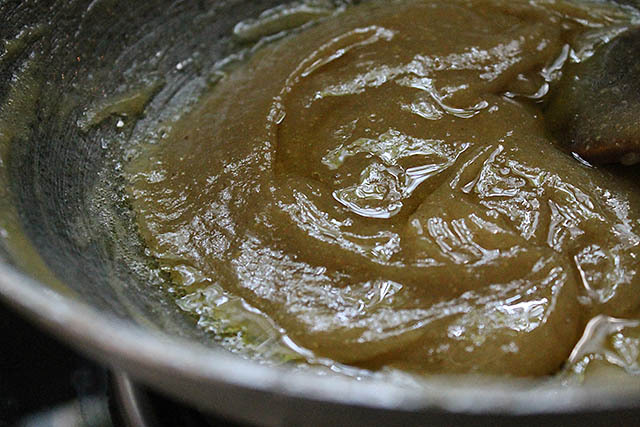 Grease a baking tray or dish with oil and place aside. Now comes the tough part peel off their skin and remove the seeds as much as you can. Once you have your guava pulp ready. Collect them and grind for 2 to 3 mins. 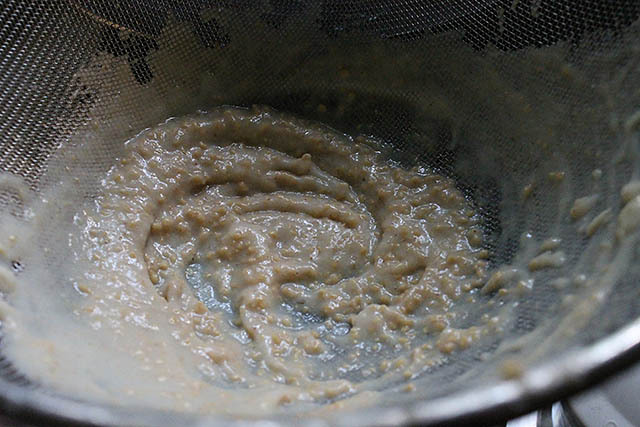 Take a fine mesh strainer and sieve the mixture gently. Once the pulp is gathered it should look appear like this. Discard this left over seed. Important part is weigh or measure the guava pulp. For instance if you have 2 cups of guava pulp then add 2 cups of powdered sugar. It should be in equal ratio. Take a wide bottomed vessel / kadai Or pan add guava pulp. Now add sugar and place on low heat. Mix all nicely and add lime juice. Keep stirring and don't allow the pulp to stick to the bottom. The color will slowly change so is the texture. 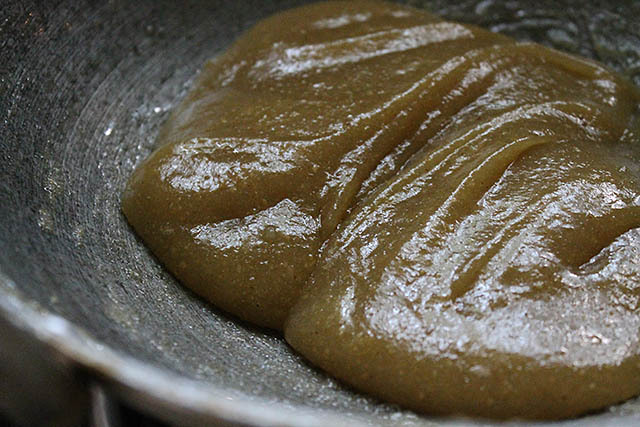 Once it starts thickening add dash of oil / butter/ ghee this would help in giving a nice shine and glaze to your guavacheese. 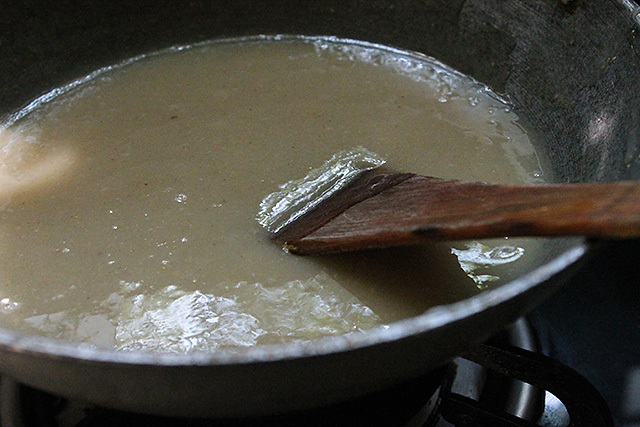 The mixture would start leaving the edges of the pan. You could check this by a simple test put one drop of this mixture in water. If it solidifies your mixture is ready. With the help of cloth or gloves pour this hot mixture over the greased tray. With the help of spatula make the surface smooth and even. I greased a small metal bowl and with the help of it leveled the surface of the guavacheese. Allow to cool down cut into squares or diamonds. Serve them or store into an airtight container should live upto a week. I have just garnished with pistachio flakes however that's optional. 1. It's important to cook this mixture on low heat and keep stirring all the time. 2. Ensure you sieve the mixture properly else the result won't be great. It's better to use a fine mesh strainer or this recipe. 3. If you are not fond of lime juice add only half a lime juice. 4. Guava pulp and sugar ratio should be equal. 5. You could also add a dash of pink or cochineal color. I dislike color in food hence haven't added. Shaheen hopefully you have cooked the mixture well please check step 11 which states : The mixture would start leaving the edges of the pan. You could check this by a simple test put one drop of this mixture in water. If it solidifies your mixture is ready. Try making guavacheese with a small batch first then make a large batch. All the best for your order and let me know if any queries. 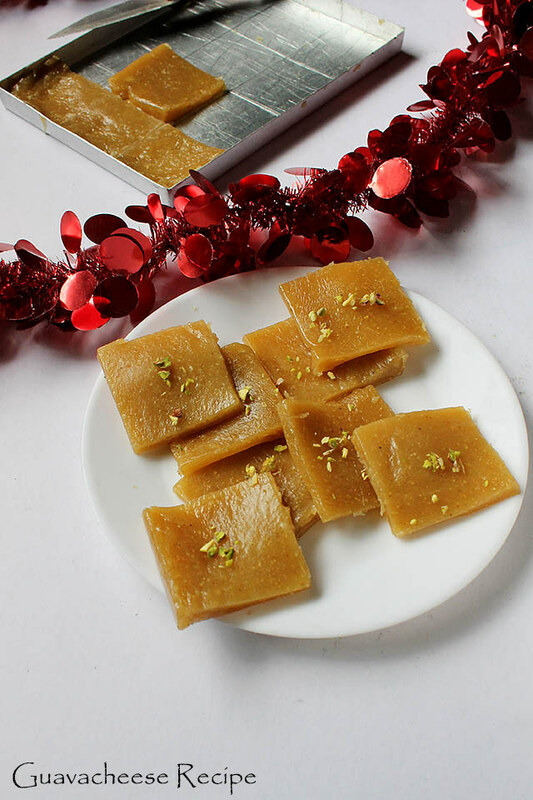 Have tried this first time and it was awesome as we always used to buy them from goa or eat during christmas. thanx for sharing this recipe my kids loved them. pleased to know this meena thankyou for religiously trying the recipes and glad to know your kids liked guavacheese 🙂 you are welcome. Very tempting Maria. Guavas are in season. will definitely give it a try. Interesting Recipe! I never thought we could make something like this out of Guava. I will surely try it! Thanks for sharing it with us.